The third installment in the extremely odd mash-up Dynasty Warriors Gundam (or Gundam Musou) will be hitting the HD consoles this winter with a cel-shaded twist. 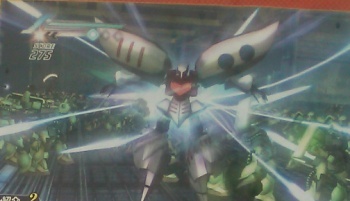 I often wonder how the idea came up to make a Dynasty Warriors game with the giant robots from the Gundam franchise. Yeah, Bandai owns both properties, but who was the madman who decided that ancient feudal China and the far future of Earth were a match made in heaven? We may never know how the games came about, but we do know that there's a third one on its way. The game was formally unveiled in this week's issue of Famitsu (the one that revealed Ace Attorney Investigations 2 and gave the new Pokemon games a perfect score), which pegged it for a Japanese release this winter - so presumably sometime later here in the West. Dynasty Warriors Gundam 3 has a new cel-shaded visual style that might bring it more in line with the look of the various Gundam animated series. It will also reportedly include beefed-up enemy AI (something which the Dynasty Warriors games have desperately needed for ages), and support online multiplayer functionality. Joining the roster of the franchise's characters and mecha previously in the series will be the cast of Gundam X, Gundam 00, Gundam 0083: Stardust Memory, and Unicorn Gundam. The Dynasty Warriors Gundam games have always been mindlessly fun if not ever particularly good, so consider me pleased by the news - particularly the inclusion of suits from 00 and Unicorn. Now, I only ask Namco Bandai that they either include more of the original Japanese voice work in the Western release so I don't have to listen to Kira Yamato's horrific dub work every time I want to play as the Strike Freedom. Either that, or - since 00 is in it now - make SEED's Dearka and Wing's Quatre playable characters, so that I can have a four-man squadron composed entirely of characters voiced by Brad Swaile. I'm a flexible guy, ok?